The rand (sign: R; code: ZAR) is the currency of South Africa. It takes its name from the Witwatersrand (White-waters-ridge in English), the ridge upon which Johannesburg is built and where most of South Africa's gold deposits were found. 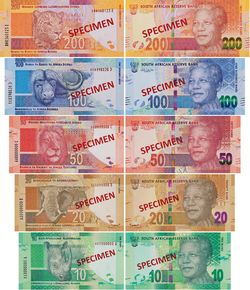 The rand has the symbol "R" and is subdivided into 100 cents, symbol "c". The ISO 4217 code is ZAR, from Dutch Zuid-Afrikaanse rand. (South African rand). Before 1961, the Dutch language was one of the official languages of South Africa.